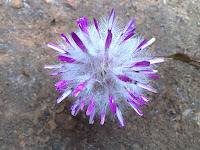 I was amazed by the variety and colourfulness of flowers along the trail, especially since I was not even hiking in spring when wildflowers are in bloom and In most cases I do not even know the names, but this flower is called bottle brush for obvious reasons - it just looks like one. 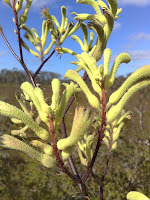 Same thing applies to kangaroo paws - although you need a bit more fantasy to see where they got their name from. 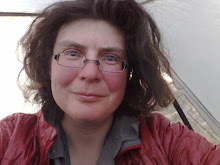 I was also fascinated by trees - all eucalyptus trees and nothing like what I was used to from my native German coniferous and deciduous forest. Karri trees can grow up to 90 meters making them one of the tallest species in the world. A fine example is the 72 meter tall Gloucester Tree near Pemberton which is the world's highest fire look out tree. The trail goes right by it and you can climb it for free using 153 spikes that spiral the tree but there usually is a line of people waiting to climb it. 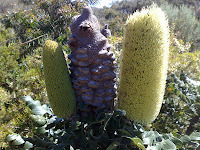 I was most intrigued by the ubiquitous banksia tree that produces flower spikes that turn into hard cones. In this picture you can see both states next to each other on a live tree. Unfortunately Banksia trees - like other Eucalyptus trees - are very vulnerable to Dieback disease. Dieback disease is an invasive soil borne water mould that slowly makes the trees roots rot. Dieback can be introduced by soil sticking to boots or car tires and therefore there are various dieback stations along the trail. 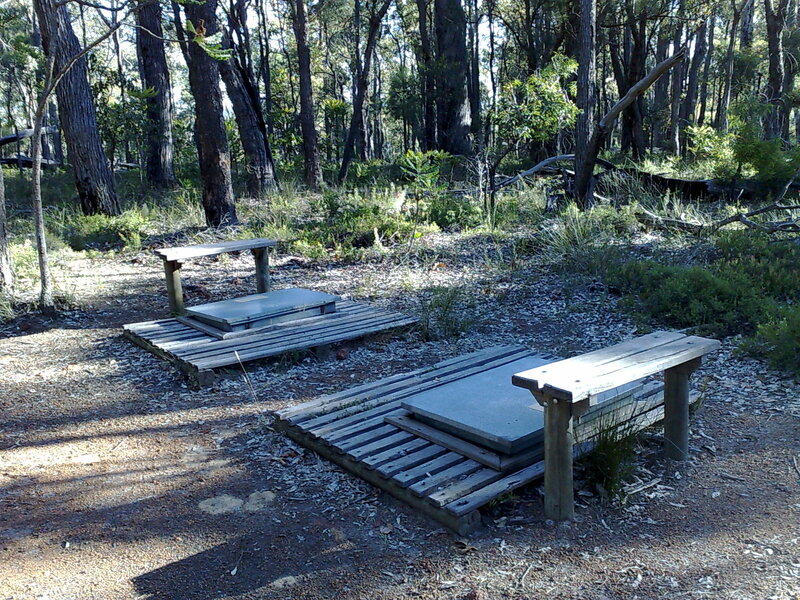 Hikers are asked to clean their boots before entering the area and brushes are provided for that . 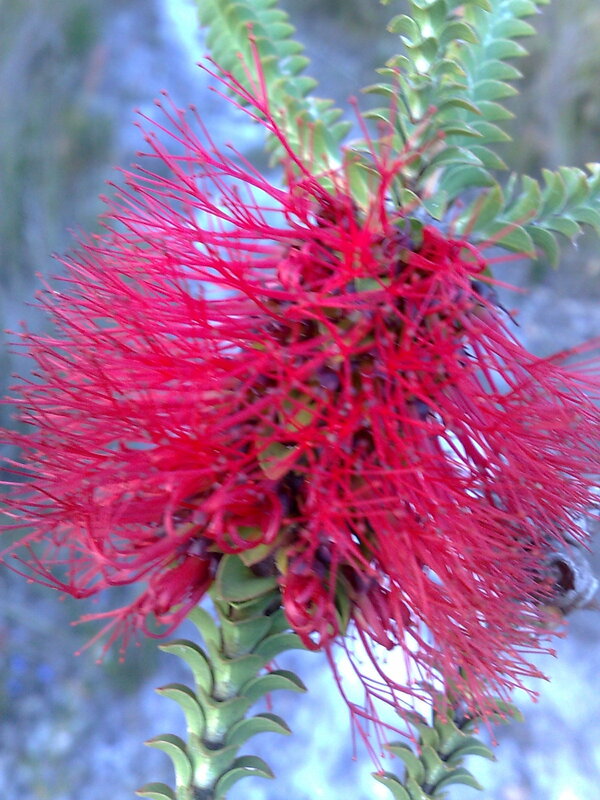 Australia is suffering a lot from invasive plants. Blackberries is a good example for that: They were intentionally introduced into Australia in the mid 1800s and soon turned into a pest. You will see blackberries a lot along the trail but be careful with eating them: Very often they are sprayed with pesticides - although warning signs will tell you. Tassie - here I come!